Thursday, November 15, 2018, 7:30 p.m. 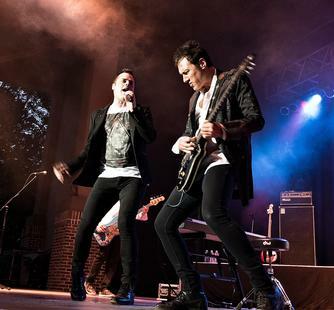 In a performance that has to be heard to be believed, singer Marc Martel not only sounds spot-on like Freddie Mercury, but also embodies the heart and soul Freddie poured into every song. After hearing Martel's astonishing audition video -- a cover of “Somebody to Love," which has since garnered over 13 million views on YouTube -- Queen’s Roger Taylor and Brian May handpicked the singer to take on lead vocals for this Queen tribute tour. The Ultimate Queen Celebration features dozens of songs that Queen made famous, including “Killer Queen,” “Radio Gaga,” “Bohemian Rhapsody,” and more.